Hero Histories: Hi, Ho, Rudolph...Away! There's more to keeping peace and providing justice for all on the wild frontier than just shooting an owlhoot who's trying to kill innocents! 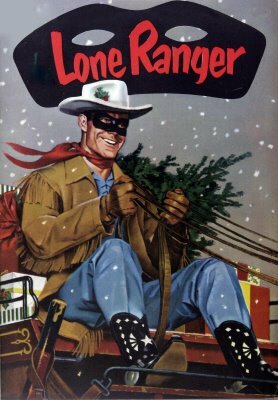 Why not join the Lone Ranger, Green Lama, Edison Bell: Boy Inventor, SuperSnipe and others at our Christmas in the Comics™ virtual storefront, where good cheer and cool, vintage graphics adorn greeting cards, ornaments, mugs, hoodies, and other seasonal stuff? But order now! The Lone Ranger can't deliver to everybody, you know!